CM: Nikos Kryonidis identifies in Lafcadio Hearn a special person who owes his achievement largely to his multilayered past in Greece, England, America and finally Japan. That is why Kryonidis presents Lafcadio as a traveler with luggage in hand. 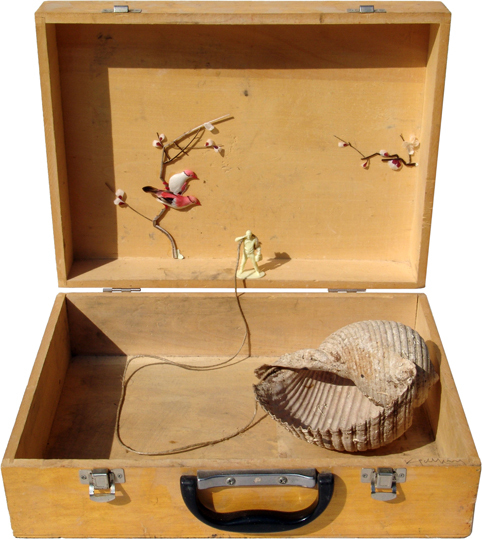 He placed the figure of Lafcadio at the heart of the opened interior of a worn suitcase. Against the backdrop of an efflorescent Japanese garden Lafcadio stands up and listens to the sounds from the islands of Greece that are carried by a rudimentary and improvised telephone machine, which uses a shell from the Greek sea. Using found material in a minimalist manner, Kryonidis creates an emotional composition that reflects the wider literary work of Lafcadio Hearn.